Communications for hospitals, long-term care, assisted living and home healthcare settings. Regroup’s award-winning, cloud-based mass notification platform is secure and HIPAA compliant, giving healthcare professionals an easy-to-use communication tool that can reduce costs, improve patient care and safety and increase patient satisfaction. In addition to being a reliable and fast tool for managing emergencies, Regroup can be used every day by doctors, staff, and patients. Our multimodal platform makes it easy to communicate within healthcare facilities, collaborate on patient care, manage staffing needs, and even provide updates and information to patients if desired. Regroup fills a niche that no other company has been able to fill. The main aspect we like about Regroup is the support. The service we receive goes far and beyond. Most vendors will sell you the product and leave it at that. Regroup is great about checking in on their clients. Broadcast your message via email, text/SMS, push notifications, desktop alerts, voice calls, digital signage, PA systems, website portals, and more. Send alerts from anywhere with only two taps, and enable staff to receive them in the palm of their hand with our free, secure mobile apps. Quickly convene doctors, nurses, and other personnel to collaborate on patient care and coordinate plans, even when your workforce is dispersed. Pre-programmed QuickPost Templates help you get information out with only two clicks so you can be prepared for any disaster your organization might face. Easily configure alerts from FEMA’s Integrated Public Alert & Warning System (IPAWS), NOAA & the National Weather System (NWS), ShakeAlert early earthquake warnings, and more. Regroup allows you to ask for status updates or request responses through a variety of channels, and recipients can respond to give you the information you need. The CMS requires healthcare facilities to have an emergency preparedness and disaster recovery plan in place in order to maintain participation in the Medicare and Medicaid programs. 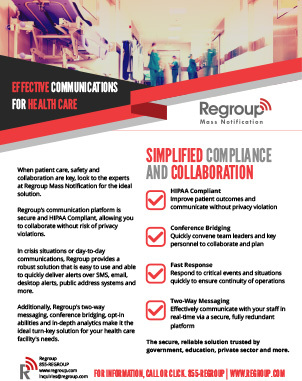 Regroup’s mass notification platform can help your organization meet many of the mandate’s requirements by ensuring your doctors, nurses, staff, and others get critical information quickly, on any device and wherever they happen to be. 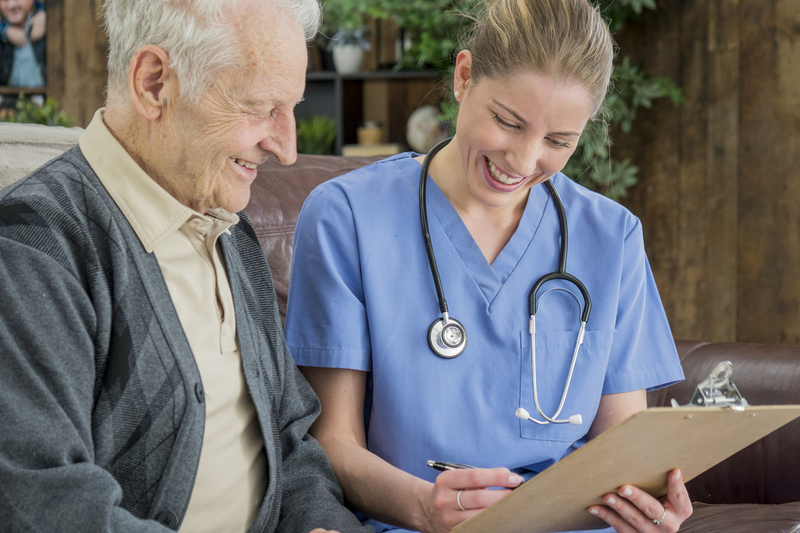 Regroup provides a secure, HIPAA-compliant platform for emergency notifications and day-to-day communications that is ideal for hospitals, long-term care facilities, home health care and more. Download our informative brochure to learn why Regroup is an essential tool that can meet your emergency preparedness requirements and make your patient care more efficient.